YOU ARE MORE THAN A MEMBER, YOU ARE PART OWNER. Credit unions are owned and controlled by the people, or members, who use their services. YOUR VOTE COUNTS. A volunteer board of directors is elected by members to manage a credit union. Credit unions operate to promote the well-being of their members. Profits made by credit unions are returned back to members in the form of reduced fees, higher savings rates and lower loan rates. 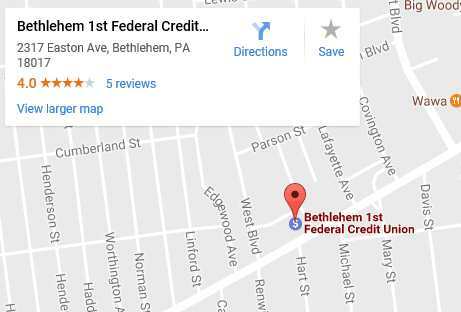 Who May Join Bethlehem 1st FCU? *Once you become a Credit Union member, you can invite your family members to join. Your entire family including your spouse, children, siblings, parents, grandparents, grandchildren, stepchildren, stepparents, stepsibilings, and adopted children can all become Bethlehem 1st FCU members. You’re welcome to remain a credit union member for life, regardless of whether you change jobs, move, or retire.